Some friends were returning from a luxurious island holiday recently. As their plane would arrive home on the lateish side I decided to be a nice guy and leave something in their fridge for when they got back. Why I did this I am not entirely certain. I had offered — on numerous occasions — to accompany them on their weeklong getaway, pointing out my not insignificant skills as a valet. To no avail. What made me decide on this particular dish I haven't a clue either. I like it. But I wasn't going to be eating it — now, was I? Friendship, I will admit, often bewilders me. Add one pound of sweet Italian sausage meat. After the meat has browned a bit, add 1 1/2 cups of broth (I used chicken here) and allow to boil for around 10 minutes. Add one 15-ounce can of cannellini beans (drained) and cook for another 5 minutes. Add a dozen or more whole clams (there are 18 mahogany clams here), then cover the pan and allow the clams to cook all the way through until all have opened. This should take 5 to 10 minutes; discard any clams that do not open. Mix in a handful of freshly chopped parsley and serve. Or, stick in somebody else's fridge and let them serve it. Either way, I won't be getting any. I remember exactly the time that I first made this torte. It was December 2011, when a few friends and I decided to celebrate Sinatra's birthday by preparing a dinner consisting of many of his favorite foods. (In case you missed the dinner, here's the link to it). The recipe for the torte, like all the other ones from that evening, is old school. They were based on recipes from the "Patsy's Cookbook," the reason for which is made abundantly clear in that birthday dinner link I just mentioned. I have made this simple, old world torte a couple of times since then, largely because it's so preposterously simple. This one was in the oven at 6:30 in the morning the other day — before I'd even finished brewing a pot of coffee. In a large bowl, mix together 3 pounds of ricotta, 3 extra large eggs, 1/2 teaspoon vanilla extract, the zest from one lemon, and one cup of sugar (the Patsy's recipe calls for 1 2/3 cups of sugar, but I think that's too much). Butter and flour a nine-inch spring form pan. Pour the ricotta mixture into the pan and smooth the top evenly, then place into an oven that's been preheated to 400 degrees F., for 55 minutes. This torte took around 65 minutes to bake. At the 55-minute mark the top had not browned at all and the entire cake was jiggling pretty good. It was still loose when I took it out of the oven ten minutes later, but it firmed up nicely while cooling. Once cooled, I covered the torte while it was still in the pan and refrigerated it for a few hours, then took it out of the fridge, removed it from the pan, and let the torte come to room temperature again. All that's left now is to sprinkle with some confectioners sugar and serve. I said it was easy, didn't I. Pretty delicious too. I can see why Frank liked it so much. All of us have friends who, for one reason or another, we worry about. I have a few of these people in my life at the moment, but none of them is more worrisome to me than Giovani. The man is unhealthily obsessed with toasted bread. Not just any toasted bread, mind you. But perfectly toasted and served bread. Done in a manner that is, above all, proper. He actually thinks about this stuff, you know. A lot. To prove that I'm not overstating, get a load of this picture. It was taken just this morning by my friend, at a luxurious vacation retreat, on an island where he and his husband Scott are supposed to be enjoying some much-needed together time. Giovani texted the toast photo to me, with the following message: "I'm a very happy man." I don't know about you, but were I the "happy" guy texting a vacation picture to a pal thousands of miles away, you can be sure that it would not be the least bit similar to this photo. Still not convinced that I have reason to be concerned about my friend's obsessive behavior? Then try this one on for size. A while back Scott and Giovani were over the house for a dinner party. An hors d'oeuvre we were serving required a bit of toasted bread, and so Giovani was naturally put in charge of its manufacture. As mine is not the type of house that is equipped with a specialized toast server (see vacation photo of said device above), Giovani was forced to improvise. 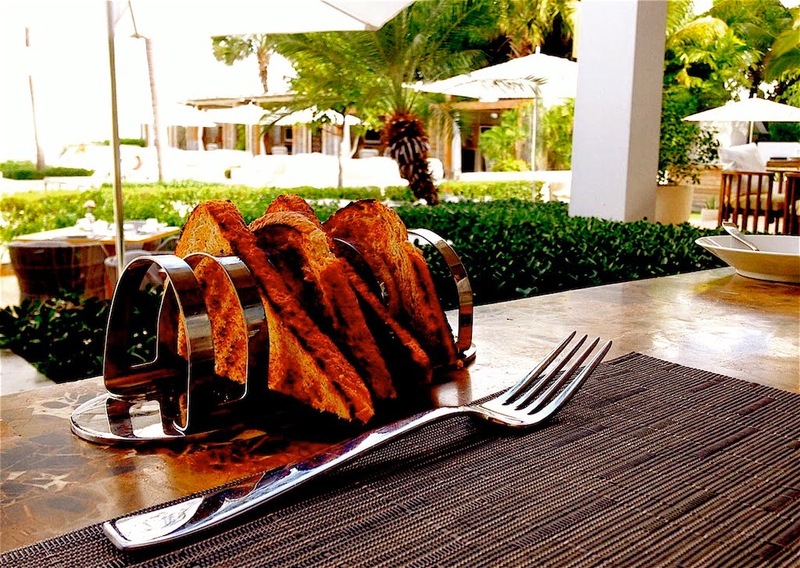 The idea here is to keep the toast slices vertical and separated. Stacking slices of warm toast, even for an instant, promotes unwanted humidity, which, according to my poor, tormented friend, "ruins everything!" I spent a lot of time last winter working in the chaotic kitchen of an ornery recluse who hides himself — and his business, if you can believe it — from public view. To get to this man required traveling four hours roundtrip from my home, often in the same day and frequently late at night and in severe weather. Our meetings, around a dozen over two months, lasted as little as one hour, or as many as eight. I was to write a magazine article about the mysterious man, a restaurant owner I am acquainted with in Rockland, Maine, named John Conte. I was also to help arrange a photo session, provided that my subject would cooperate, a detail that I knew to be anything but a certainty. "Can't we just talk to each other?" he told me, more a statement than a question. "Why's it so important that people see me? "Besides, what's wrong with you? I see you taking pictures around here all the time. Why can't you do it?" I reminded the man that photography is my hobby, not profession. Besides, I assured him, the magazine that had wanted to purchase the article about him was unlikely to agree to such an arrangement. Conte scurried off to attend to an order of pasta that had been boiling, in a deep fryer he fills with water instead of oil. I positioned myself near the dishwashing station, well out of the man's way, and snapped a few more photos. John Conte clearly conducts entire conversations with himself as he goes about his work. Which should not be at all surprising for a man who spends so much of his time in seclusion. I guessed, correctly as it happens, that the talk he was having at the pasta station had to do with me and my request to allow a photographer into his very private space. "I think it's gotta be you who takes the pictures, nobody else," he said calmly. "Otherwise, let's just forget about it." For a man who so willfully hides himself and his restaurant from public view — Conte never shows his face in the dining room or elsewhere during business hours and the restaurant doesn't even have a sign out front announcing that it's there — the man's reticence to be photographed by a complete stranger, though problematic for my assignment, seemed perfectly reasonable. After all, Conte may be the least social person that I have ever known. He spends nearly every waking hour inside the walls of his restaurant, an Italian seafood place known as Conte's 1894. And when I say every hour I mean every. Conte works alone in his kitchen, and he is open 365 days a year. He orders, preps and cooks all the food, cleans the dishes, even mops the floors. The man hasn't had a single day off in an awful lot of years — and hasn't dined in anybody else's restaurant in a quarter century. Actual sitings of Conte outside of his establishment are, I can assure you, quite rare. I let a little time pass before revisiting the topic. "So, John," I said, helping him to lift a gigantic loaf of homemade bread from the oven, "you think any more about that magazine thing? The photographer coming, I mean? I don't think they'll want to run the story without them, if that matters to you at all." The two of us carried the bread to a cooling rack. He'd earlier poured us both a glass of wine and each of us took a sip. "You're the only person I want in my kitchen, so that's that, I guess," he said, without a hint of remorse. "Besides, what do I need to be in a magazine for anyway?" I should mention that I consider it a great honor that, to this day, John Conte welcomes me into his kitchen freely and at all times. We talk easily with one another, laugh a lot too. As the man lives his entire life in his restaurant, basically he has welcomed me into his home. I'm proud to now call him friend. By the way, Conte wound up getting his wish. The story, accompanied by photos that I had taken over time, was published last summer, and can be accessed by clicking on this link right here. Only a couple of my portraits of John appeared, however. I was looking over the bunch of them the other night and thought you might like to have a look at some of the rest. Which I suppose you just did.